Start the barbecue, if using – start cooking when the hot coals are covered in a light layer of ash. Brush each fi sh all over with about ½ tbsp olive oil and season, inside and out. If you’re not barbecuing, preheat the grill to medium. Whether you’re barbecuing or grilling the fish, cook them for 6 minutes, then turn and grill for another 6 minutes, until the skin is golden and the white flesh flakes easily. Meanwhile, halve one lemon and squeeze the juice into a bowl with the remaining olive oil and herbs; season to taste. Cut the remaining lemon into wedges. 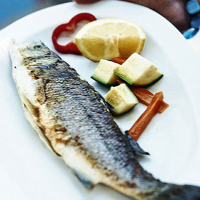 Serve the grilled fish with the lemon dressing, ready to spoon over, and accompany with a lemon wedge.